The snakekind is a race that was created by a sorcerer, who was aiming to create the perfect dragon killer. There are several different variants; jarza, herza, tuzak, dulne, zakura, zelne and riven. Each type is different, possessing different abilities from the other subtypes. There is a hierarchy as well with the Jarza at the top. Many of the snakekind types harness elemental magic along with their unique physical talents. Hoods A hood on any type of snakekind denotes high intelligence, leadership skills, or a member of royalty. Serpents of any type will bow to the hooded ones, and they automatically are considered high in rank in any military faction. Some hoodless leaders may have 'phantom hoods', or hoods that appear when using great power, as Snayc once did. Symbols Each snakekind subtype has a special symbol denoting what it belongs to. There are five different classes: a Flight type, a Runner type, a Slither type, a Soldier type and the esteemed Elite type. As new snakekind species are created or discovered, they are filed into one of these classes. In serpent armies, their soldiers are branded with this symbol, a sign of both pride in their type and unerring loyalty to their commanders. Senses In addition to the honed senses of any normal snake, all snakekind are able to see and sense things far greater. They may see heat signatures of living creatures with very little effort, and hear noises of a very high frequency. Many may also 'taste' the air with their tongue to sense another's power and range of ability. Interclass Hybrids Hybrids between the classes are always possible, and usually result in one of the existing types. However, 'breeding up' - as it's been called - from two lesser types into a greater type will often result in a serpent of very little power as compared with a pureblood. For example, if a zelne bred with a herza and their hatchlings were all jarza, their power would be half that of one with jarza as both parents. There are, on the other hand, always exceptions to this rule. Appearance A race of extreme malevolence, created by a sorcerer aiming to create the perfect dragonkiller. Snakekind come in many different types, separated by specialty and appearance. Though each subtype has defining features marking it for what it is, the type of snake, markings and mutations can vary greatly between individuals even within their own class. Jarza: The jarza is a great snakekind, the elite-class warrior among its peers. They are long-bodied with exceptionally long necks and generally have pit-viper faces. Sometimes, a jarza may be born with a double set of eyes. These creatures appear very dragonlike, and have large wings and four legs. Every jarza has a barbed tip to its long tail, colored more brightly than the rest of its smooth, scaled hide. Herza: A flight-class herza appears much like a legless jarza, the serpent equivalent of a draconic amphithere. Most - not all - have translucent wing webbing with brightly-colored wing fingers; otherwise, their scales are generally dull. Some may have horns that secrete a hallucinogenic venom, enhancing the effect of their bite. Tuzak: Often referred to as the mistake that brought about the creation of the jarza, the tuzak is a wyvern-like flight- and runner-class snakekind with exceptionally odd wings as opposed to others of its kind. Each tuzak is different, and most are very brightly colored. They also have very large hind paws with long, curved claws. Dulne: Smallest of the serpents, the dulne is much like a wingless tuzak. They stand no taller than a human child, are usually brightly colored, and can run exceptionally fast on their only pair of hind legs. They also have a barb on their tails that they use to cut down enemies, striking at the ankles or the backs of their knees. Zakura: Almost the complete opposite of a dulne, a zakura has forelegs instead of hind; much like the draconic lindwyrm. This slither-class snakekind is small but quick, able to maneuver where many of its kin could not. Most have rows of venomous spines down their backs and tails, making up for their lack of physical power. Zelne: The zelne is considered a 'soldier-class' snakekind, due to its wingless, anthropomorphic qualities. Shorter-bodied than many of its brethren, the zelne has the ability to stand and walk on its hind legs, utilizing its foreclaws to grasp and wield. Most numerous of all snakekind, and considered expendable by those of the elite classes. Riven: Last is the founding serpent, the riven. Though these snakekind look much like the creatures they were created from, having no wings nor legs, they are much different. Most often, a riven's coloration is dark, mostly black, sometimes marked with brightly-colored designs and patches. Their scales are hard as diamond, and their size can vary from a human's height to well over a dragon's. They are of the elite class, ranked alongside the jarza. Culture Snakekind subtypes range in intelligence from the simple- or hive-minded (the latter in the case of the dulne specifically) to great leaders like Snayc and his offspring. Generally, the average snakekind will have the intelligence of a ten year old human child. Despite this, the serpent-kin of old has a unique culture generally hidden away from the world of light. Militaristic and generally patriarchal, these colonies live underground and in secluded places where they may train, live and breed in relative peace. Led by the Hooded, some of these armies may rival the skill set of other, greater militia, and many more are trained to know no fear. This, coupled with their abilities listed below, make the snakekind an incredibly versatile foe. Abilities Each snake subtype has its own unique abilities. Though some may be similar to another, their venom all acts in a different way. Many may harness elemental magic and reiatsu capabilities as well as utilize their own physical talents. 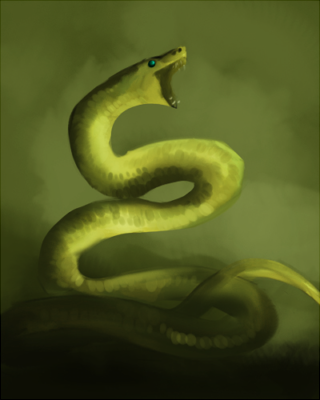 Jarza: As elite of the snakekind, even above the great riven, the jarza carries with it a venom expelled from both fang and barb that has a most devastating effect on its victims. Once injected, this poison quickly flows through the body's bloodstream, attacking with physical paralysis and constriction of thought. The magical qualities begin to take hold after the victim's fallen unconscious; it locks the soul within its own mind, burning the mindscape as the soul is held in some sort of black-barred cage, its appearance unique to every story. As the fire begins to overtake the cage, it traps and destroys the mindbeast, and then obliterates the soul. Herza: The fangs and horns of the herza secrete a hallucinogenic venom, one that locks creatures into seeing their nightmares made real once injected. The victims will usually be paralyzed by fear in seeing their worst imaginings made real, letting their enemy deal the final blow. Sometimes, the victim is so caught up in their nightmare that the herza becomes invisible to them, and they never see the end until it's already upon them. Tuzak: The tuzak carries a venom much like the most dangerous of normal snakes - a flesh-eating toxin that, once injected, will cause the immediate deterioration of tissue, muscle and bone. It acts very, very quickly, and can cause irreparable damage if not reversed within a few moments of injection. Dulne: Though equipped with a barb much like the jarza, the dulne's venom is actually very, very weak. It is incapable of causing death, though can cause numbing paralysis if left untreated for long amounts of time. Mostly, the dulne uses its exceptional speed to dart in and out of enemies on the ground, cutting tendons in ankles and knees with its barb and talons. Zakura: A zakura is known for the poisonous barbs along its back and neck, their venom causing swift pain and violent contractions moments after being struck. Though not terribly accurate, a zakura's bite can inject a double dose of what the spines can, often leading to fatal cardiac arrest. Victims of a zakura's venom have reported that long-standing symptoms remain even after recovery, such as numbness of the fingers and toes, or twitching of a limb. Zelne: The zelne is unique in that its claws hold more venom than its teeth. The venom secreted in this way causes a burning pain to be spread through the bloodstream, leading many to believe their blood is actually boiling. Though this rarely causes death, it is a proven distraction for the zelne to draw a sword or other weapon and cut down the enemy while they suffer from the pain. Riven: The abilities of the riven are exceptional in their span. First and foremost is the double-venom they utilize; both attacking physically, eating away flesh - and mentally, destroying the mind as it tries to fend it off. While a victim may be dealing with its bite, a riven often encircles its enemy with its coils, and crushes them until they move no more. Creation Year: 4097. Realm of Origin: Millirand. After being exiled from Ki-Lia, Gorg’rauth disappeared deep into the Rage Desert, furiously swearing to take his revenge upon the dragons he believed had wronged him, refusing to accept he had done anything wrong. He dwelled within a series of caves in a jagged range of hills and low mountains, sharing his rough abode with several different types of snakes, often feeding upon them. But, even as they satisfied his hunger, he decided they could satisfy his thirst for revenge. Drawn to the great cobras, with their broad hoods and great size, he took all he could find and began to work powerful magics upon them. Eventually, he singled out the biggest of them, and focused all his energies upon it, gifting it with enormous size and strength, enough to rival a dragon, and covered its body with thick, black scales, hard as diamonds. He awakened within it the ability to forge mighty spells, and vastly increased the deadliness of its venom, gifting it with extra fangs so it could pump more of its venom into a victim with one bite. He called his new creation snakekind, and decided this great, limbless shape would be the basis for the riven, for he planned to make different forms, each with their own shape and specialty, and each with its own type of venom. Pleased as he was with his new creation, he set the riven to clearing the area around the caves so he could raise a mighty fortress in the heart of the desert. More riven joined the first, and the great snakes labored to raise mighty walls of stone as Gorg’rauth set about creating the other types of snakekind. Driven as he was, and given how hard he drove his creations, it wasn’t long before he had both his great, dark fortress, and a vast army of snakes, living both in his fortress, and within the much-expanded caverns in the hills and below the fortress itself. He named his fortress Gorganoth, and from there, planned the first phase of what would become known as the Age of Bloodshed. Name: N/A. Location: N/A. Status: N/A. This species did not have an Ancient First. Classification: humanoid snakekind. Location: primarily Millirand. The naga is a forerunner of serpent, created upon the first dabblings in trying to create the snakekind. With the tail of a long snake and the torso, arms and face of a humanoid, these creatures shun their lesser intelligent brethren as the failed experiment themselves, though their power is often much less then that of a jarza or other snakekind higher class. Though shunned from any society but their own, the naga are a very civilized species, and live in deep subterranean cities dark and hidden to most others' eyes. Their appearance can vary as greatly as the snakekind's; with a color range spanning the rainbow, their scales can range from deep blues and purples to bright reds and golds. They can also have a more reptilian appearance, with scales reaching up to cover their human bodies, and some may have frills, horns or other such features replacing the hair atop their heads.